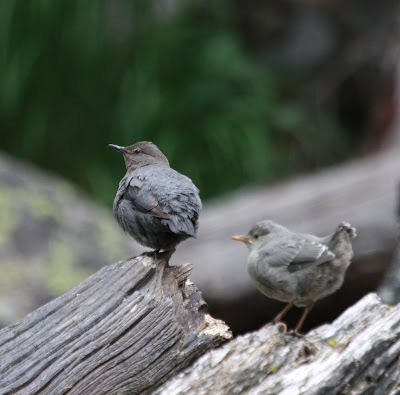 On Friday, July 24th, we decided to hike back to Ouzel Falls to photograph the fledgling American Dippers again and also try to find an American Three-toed Woodpecker, which we hadn't seen on our last trip. 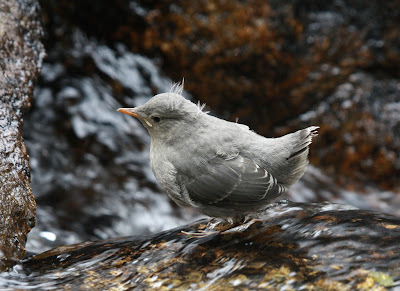 At the first river crossing, we saw an adult American Dipper fly under the bridge, and we did not see it fly out the other side. 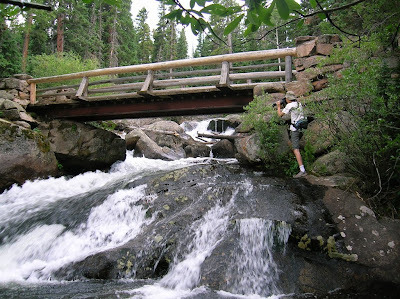 We didn't investigate whether or not there was a nest under the bridge, because we were in a hurry to get to Ouzel Falls. 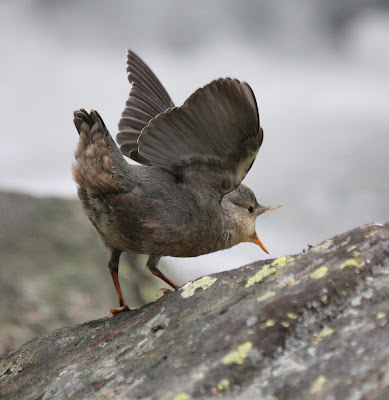 Another dipper was spotted flying downstream at Calypso Cascades. 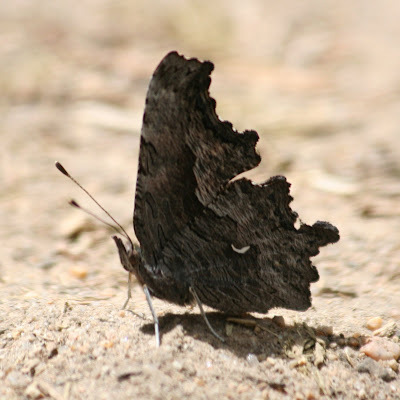 I (Joel) also saw a Black Swift high in the sky while we were walking through the old burn zone. When we reached Ouzel Falls, there were no signs of dippers anywhere, but we did see adult and juvenile Golden-crowned Kinglets in the firs near the river. We spent some time observing them before heading back down the trail. 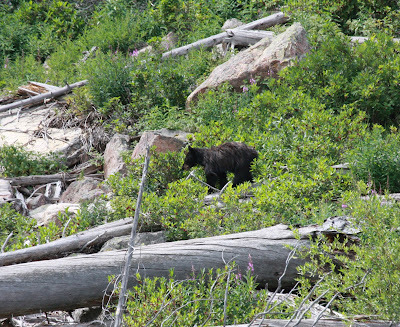 While we were showing another hiker some Red Crossbills and distant Band-tailed Pigeons, we noticed that there was a Black Bear feeding on the opposite hillside. People started piling up around us, as we observed the bear. Many of them had never seen a bear in the wild before. At the old burn zone, we saw a couple Wilson's and Yellow-rumped Warblers along with singing Hermit Thrushes. 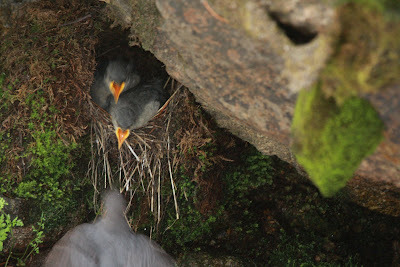 Back at the first bridge, we peeked to see if there might be a dipper nest. 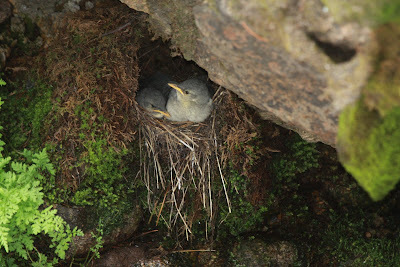 Sure enough, there was a nest on a boulder just under the bridge with two chicks. We spent a lot of time observing the adult coming and going, as it fed the chicks. 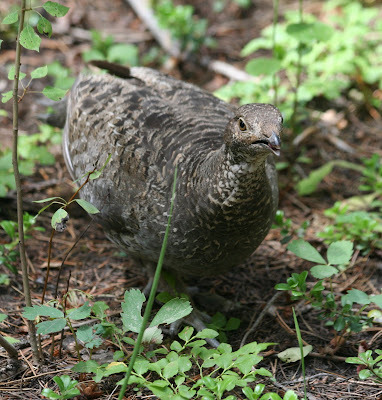 Just before reaching the parking lot, we found other hikers puzzling over a chicken-like bird with its two chicks grazing on Kinnikinnick berries along the side of the trail. 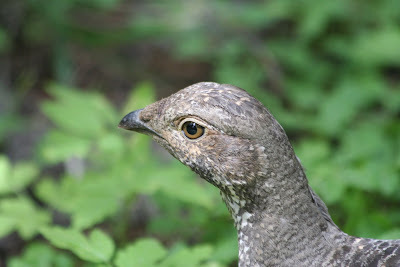 The birds were Dusky Grouse! 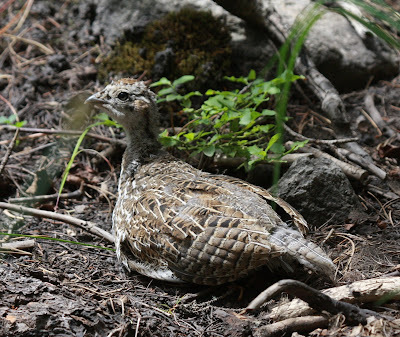 When we told the ranger about the grouse, he said that this local grouse had started out with 8 or so chicks, but now is down to two chicks with foxes likely having devoured the others. 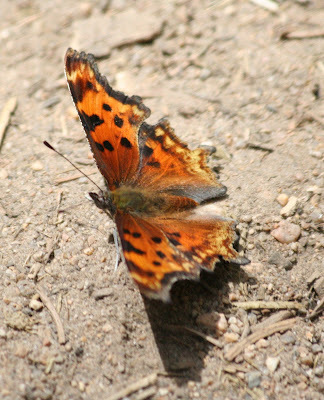 Below are a couple photos of butterflies we saw that day. 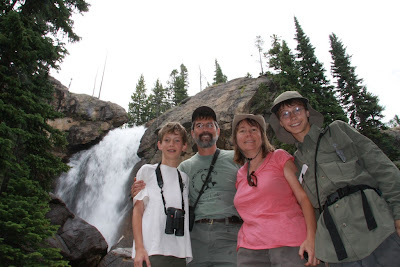 Yesterday morning we hiked to Ouzel Falls in Wild Basin, Rocky Mountain National Park. Black Swifts nest behind this waterfall. Besides the swift, our two other "target" species for the day were Golden-crowned Kinglet, which we should have seen long ago, and American Three-toed Woodpecker, which is making a comeback due to all the trees infested with Pine Beetle. We scored on Golden-crowned Kinglets right away (lifer #1)! There were two of them calling to each other near Copeland Falls. We also got a quick glimpse of a Warbling Vireo where the kinglets were. 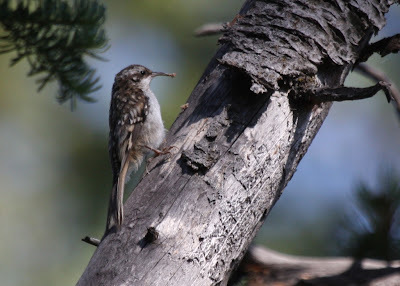 At Calypso Cascades we first heard, then saw, four Brown Creepers “creeping” up trees while foraging right along the side of the trail. 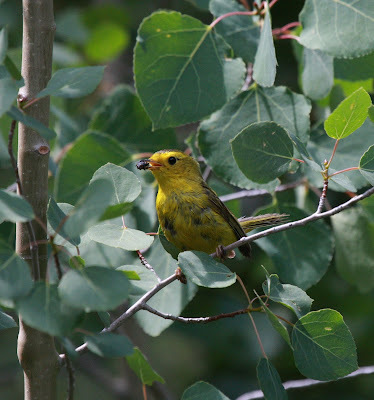 At the old burn zone we saw a MacGillivray’s Warbler pair in some young Aspens and a Hermit Thrush singing in the top of a tall snag. 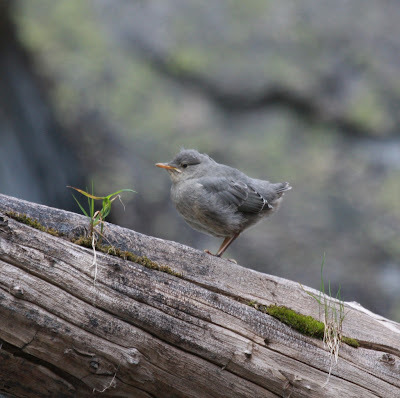 Other Hermit Thrushes were singing in the distance. 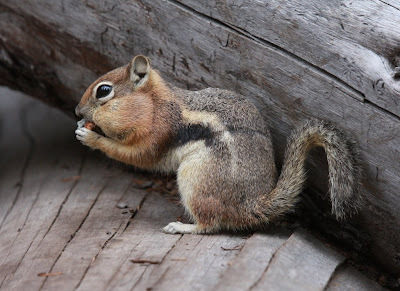 At Ouzel Falls there was a very tame Golden-mantled Ground Squirrel that was begging for handouts from other hikers and having much success. Of course, we ourselves didn't share with the ground squirrel. Not only is it illegal to feed wildlife in the park, we personally wanted to consume every morsel of our own snacks! 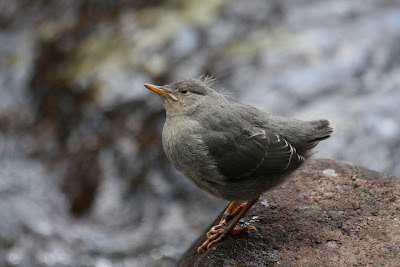 Below Ouzel Falls by the bridge we spent quite a long time observing a busy adult American Dipper (or Water Ouzel) actively feeding three fledglings. There were a lot of people out on the trail today, but few seem to notice these amazing little birds dipping and diving into swift moving currents. Traveling beyond Ouzel Falls, we discovered that there was a side trail that would take us into different territory for a portion of our return trip. It was starting to threaten rain, so we had to hustle back down the remaining three miles of trail. On the way down, Joel spotted two Black Swifts “swiftly” flying by (lifer #2). Back on the main trail, we found a flock of “Gray-headed” Dark-eyed Juncos, which is our only local breeding subspecies of Dark-eyed Junco. There were actually more streaky juveniles than there were un-streaked adults. 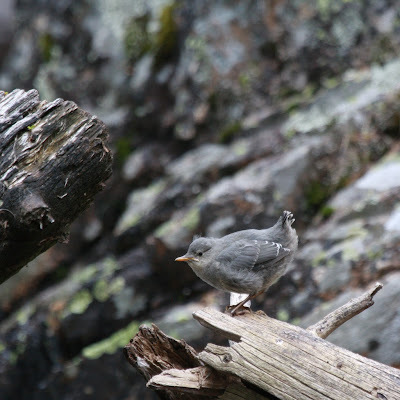 Marcel also found another adult dipper as we neared the trailhead, this one feeding just one fledgling. When we neared the parking lot, the sun emerged again. 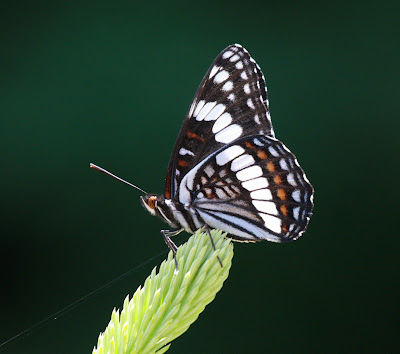 It was a nice two-lifer day with some extra entertainment thanks to the creepers and dippers! And oh . . . Happy Birthday, Mom!